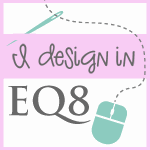 New Sewing Space and Some Quilting Fun! 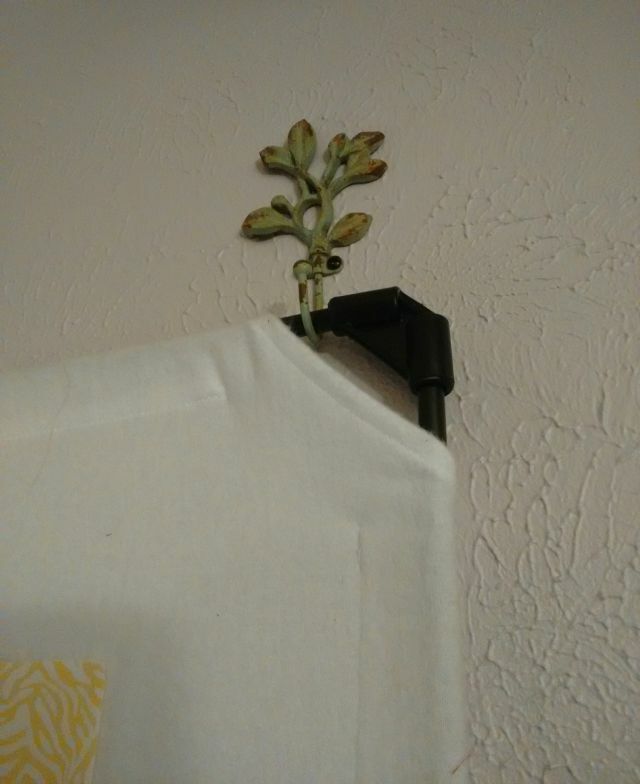 We’ve been in our house for almost 3 years now and have slowly been decorating. We have remodeling plans in mind, but when you’re on a budget, you stick to the priority list. I originally knew my sewing space would be shared with the guest room, but so far, I’ve made the entire space a sewing room…oops! 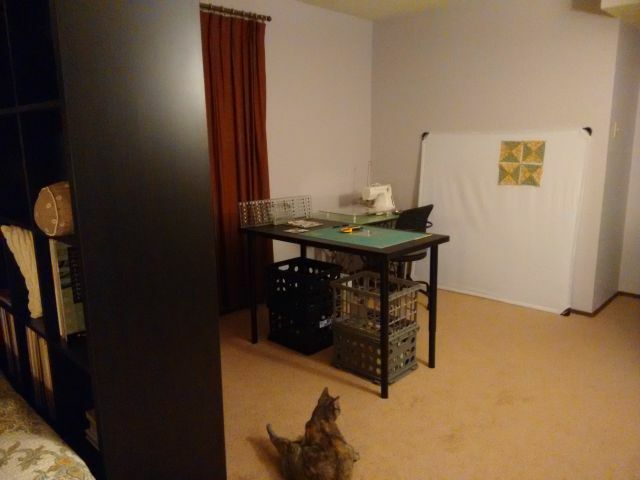 We recently decided to make use of the extra space in the master bedroom as my sewing area. The master bedroom measures 12 x 20 ft. And we only use a small portion of the room for the bed. 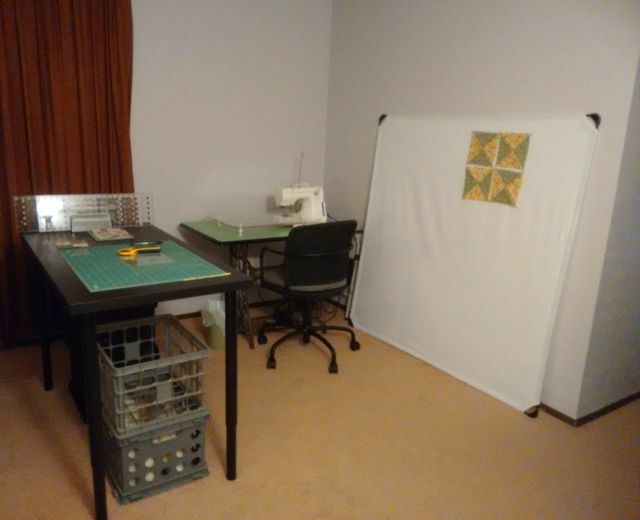 With such a lengthy room and the bed on one end, the other end has been wasted space, so we decided there’s plenty of room for the sewing area. With the plan in mind, we decided to also paint the walls. We were looking for a calm and serene color, then decided on something lavender. Husband wanted dark and I wanted light….we finally agreed on Stardust Evening by Valspar. The painting project took a good two days. We’re first time room painters and we also patched a few spots and needed to work around them until they were dry enough for painting. Mom came over and showed us her painting tips and techniques — What a pro! 😀 Neko and Petey were not happy about being kicked out of the room for an entire weekend! Yesterday, Mom came over and we had ourselves a quilting day! First we headed out to our local quilt shop to pick up the Row by Row pattern, which mom is working on, and I bought background fabric for my wall quilt that I was able to start. 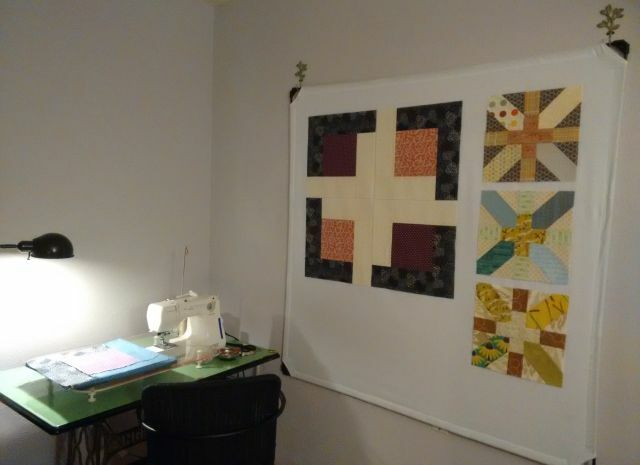 We were able to setup a sewing station for my mom at the window and we accomplished alot over stories, wine, snacks, and laughs 😀 Mom finished her quilt top, from a set of two matching quilts for my cousins. I also finished the Plus Quilt top! 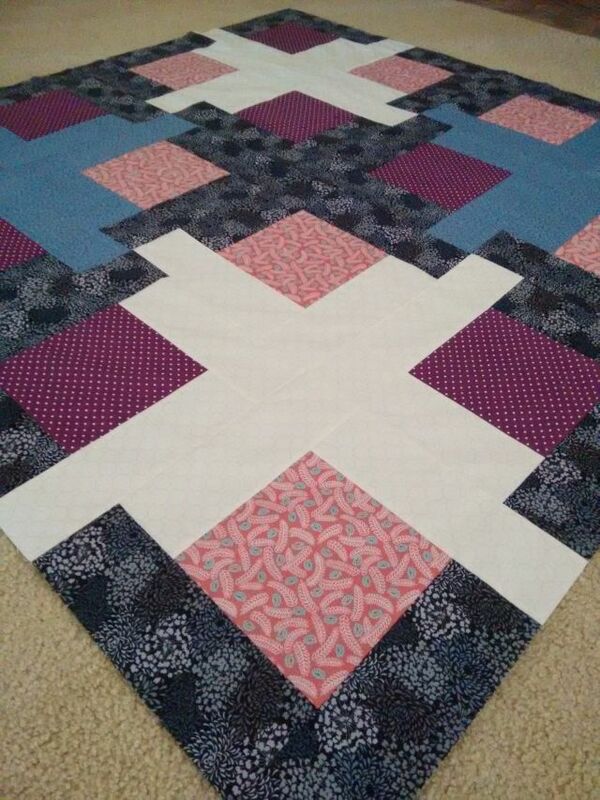 All I need now is the backing and batting to get started on the quilting. I then got started on my wall hanging quilt. I’m super excited about this quilt from the Moda Bake Shop. It’s called the Sunburst Quilt by Lauren Terry. I’m making a smaller version using 9 blocks, instead of 12. It will finish 36×36″. Mom surprised me with some new fat quarters, which I decided to include in my quilt because they were perfect for the project! 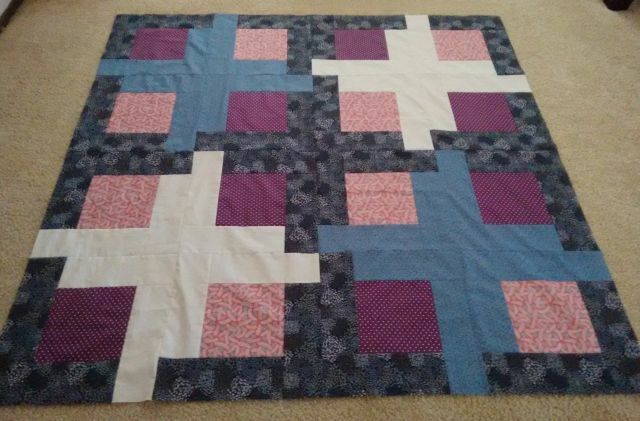 I was able to finish one of the blocks last night before our sewing day came to an end. 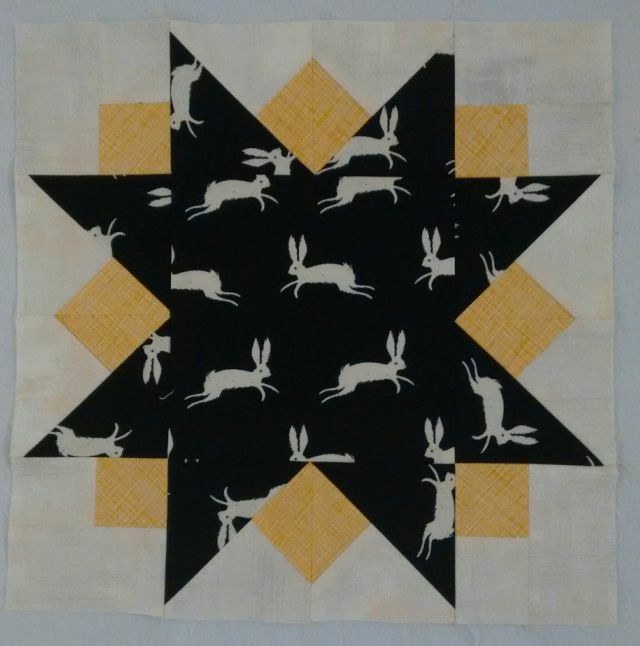 This block features Ghost Bunny by Sarah Watts, a collaborative effort from the Black & White collection for Cotton and Steel. For the sunburst points I used Carolyn Friedlanders Crosshatch in Curry for Robert Kaufman Fabrics. The background for this, and all remaining blocks, is Moda’s Grunge Basics in Winter Mint. All in all, we had a great time sewing together. Can’t wait for the next! Your master bedroom and sewing space turned out beautiful. My son-in-law did a great job at his part building/setting everything together. 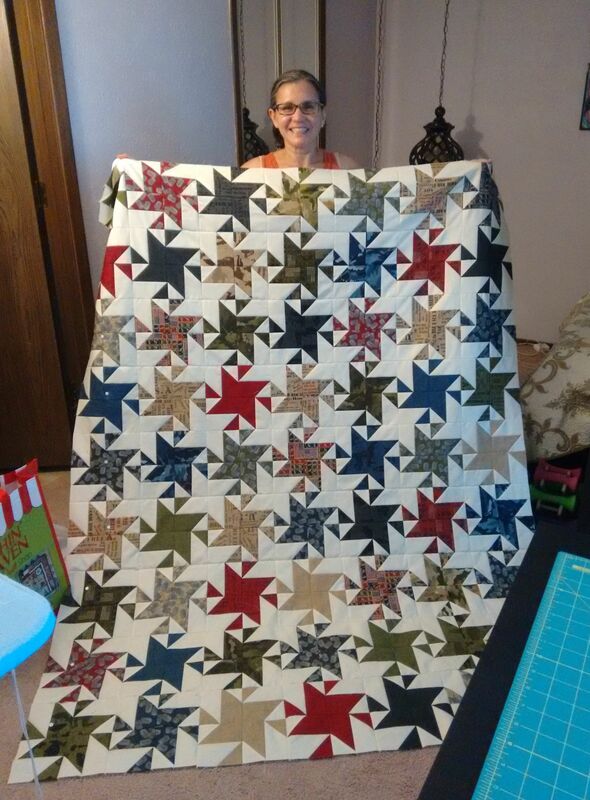 Your quilt top and sunburst block are beautiful. Glad I purchased the fat quarters in time for the perfect use. Thank you!! What an awesome husband to put so much thought into my sewing space! I thanked him for all the great music he played for us while we sewed 🙂 Thank you again for the fabric! Oh wow your stitching space looks amazing. I wish I had a dedicated space like that. I love your quilts they look amazing. Thank you! I’m still getting used to the space. The quilting has an organized space, but my cross stitching is still mobile. I put all my supplies in one of those crates, which makes it easier to move and stitch in another room. Where do you stitch? Your sewing space turned out so very cozy looking. You are so lucky to have your mom to quilt to quilt with you. I used my master bedroom as a dedicated sewing studio—and sleep in one of the smaller rooms–kind of crazy, but it works for me. Thank you so much! Yes, I’m very happy to have this sewing bond with mom 🙂 Just last month mom got with her mom and sister to quilt! 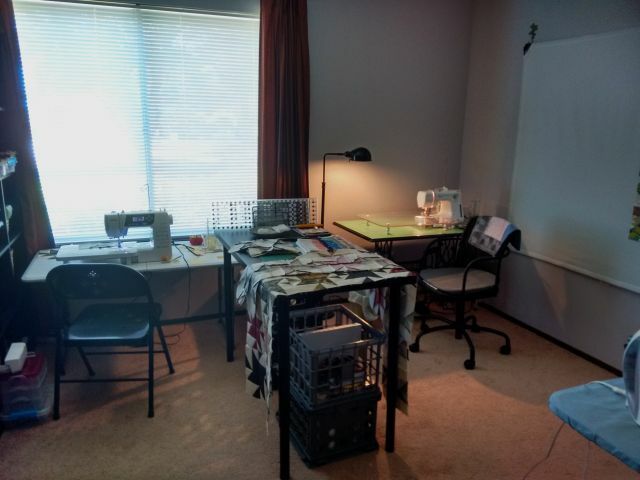 Wow, a master bedroom sewing room! It makes sense though, we only need so much space to sleep. That’s why our bed is tucked away in the corner, it’s a cozy spot too!